When Portland (Oregon) Tabernacle Corps Officer Lt. Laura Fyn walks through the Rose Center for Seniors, it’s common for her to overhear snippets of conversation in passing. But the ones regarding fears of police brutality really weighed on her heart. The timing was right. 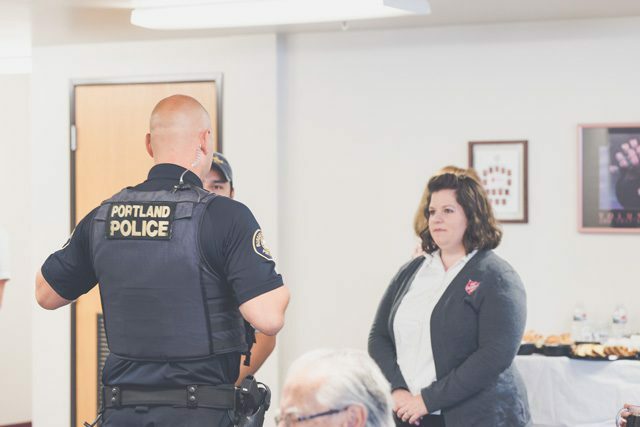 A newly inducted Portland Metro Advisory Board member, Portland Police Bureau Assistant Chief Chris Davis, connected Fyn with the Chief of the Portland Central Precinct. Together they planned a Coffee With a Cop morning at the Rose Center to help bridge the divide between law enforcement and the general public in Portland. The corps advertised Coffee with a Cop on its Facebook page and more than 20 people from the corps and the community came together for the first event in July, including a prominent Portland activist who had never visited The Salvation Army in Portland. Fyn said organizers hoped for organic conversation between the police and the public, and they were prepared to facilitate discussion if needed. But it wasn’t an issue—the officers held conversations with attendees on their own. Taylor said it’s not possible to police effectively without the community’s help, since the police are “an extension of the community.” Organized events like Coffee with a Cop help, but so do informal sit-downs when there is an opportunity. Coffee with a Cop opened doors for Sammy Wright, who has grown up in The Salvation Army and is currently in the Portland Police Cadet Program. At the event, Wright was given the opportunity to talk to the police officer who patrols his neighborhood and was invited for a ride along.